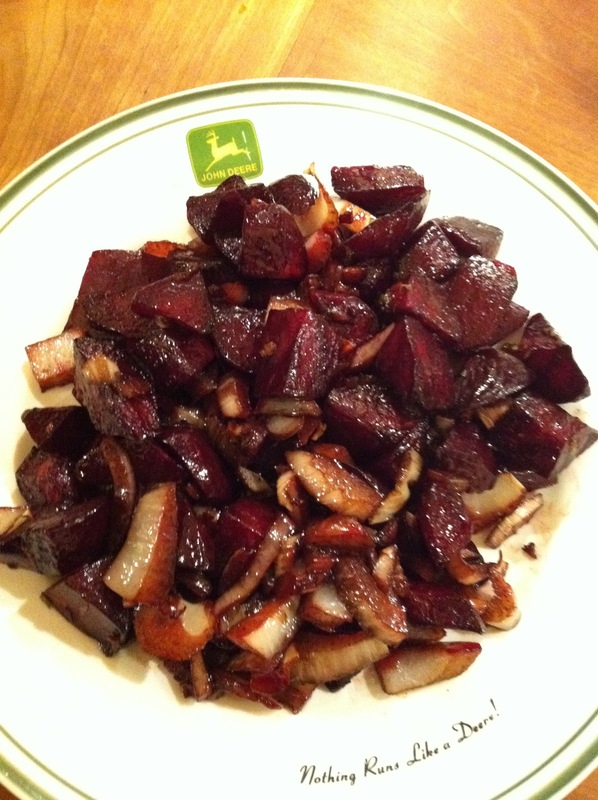 I love roasting beets simply with a little olive oil and salt, but last night I got a little crazy and added some sautéed fennel and balsamic….really special. After preheating the oven to 425 degrees cut the ends off of your beats, peel or cut away the skin with a paring knife, cube, then toss with a little olive oil and kosher salt. Roasting takes about 45 minutes to an hour. Twenty minutes before serving sauté a chopped fennel bulb until it’s soft and starting to brown around the edges. Add a chopped garlic clove and a half cup of balsamic vinegar to the pan along with a couple tablespoons of sugar. When the liquid is reduced by half and starting to get syrupy simply toss together with your roast beets. If fennel isn’t your thing you could easily substitute an onion or use the balsamic reduction on it’s own.